He may be gone, but his memory and legacy live on. Ray Charles, the "Genius of Soul", and the only musician in history to stay at the top of the charts for five decades, delivers a spellbinding performance here with Live at the Montreux Jazz Festival. 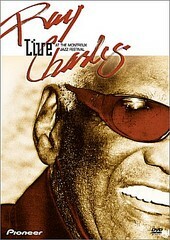 It is a DVD packed with commentary by Ray Charles himself as he discusses the songs he performs at the show, his career, and his passion for music. The DVD also features biography and liner note information. Including hits such as "Georgia On My Mind", "Angelina", "I Can't Stop Loving You", "People Will Say We're In Love", and plenty of others, here is seventy-three minutes of Ray Charles at his finest. He will be missed, that is for sure. However, any time you feel the need, put on Live at the Montreux Jazz Festival and he will appear, in your living room, playing the songs that made you feel love once again. I'll give it an A-.